Mosquito foggers sprinkle insecticides into the air, thus killing and repelling mosquitoes and other biting insects such as biting flies, no-see-ums, and others. During the sprinkling, a fog is formed. The fog is able to penetrate into the depth of grass, trees and bushes protecting your backyard. Let’s take a closer look at such devices. In our review, you will find the five best mosquito foggers: three thermal and two cold foggers from $70 to $285. How Do Different Types of Mosquito Foggers Work? Manual. These are thermal foggers (Check the current price) operated by propane or electricity. They act in the same way as stationary ones, but to create tiny sprinkling drops, they use heat produced as the result of propane chemical reaction or heating effect of electric current. It is recommended to wait for the heat fogger to become warm before using it and empty the container with a fogging product after using. Stationary. These are mechanical “cold” foggers (Check the current price) operated by electricity. Petrol engine foggers are rather rare. These cold foggers don’t use heat for evaporating and spraying the insecticide. Instead, their engines generate a powerful high-pressure air flow that disintegrates the fogging liquid into particles that are sprayed through the nozzle. The differences between cold and thermal foggers become more obvious during use. Fog appearance. Thermal foggers generate a dense white-grayish fog that is well-seen and can be easily controlled. Fog produced by mechanical devices is nearly invisible to the human eye, so rookies might find it difficult to figure out where to spray the insecticide. Fog drop size. Thermal foggers generate very small drops that congregate in a dense veil which sinks to the ground slower. The University of Massachusetts Amherst experts confirm that fog particles can float in the air for up to six hours which have a positive impact on the effectiveness of mosquito control. Cold foggers produce larger drops that are dispersed in the air and sink faster, hence more frequent treatments. Territory treatment time. When a thermal fogger is on, the insecticide is injected in a fast, hot and powerful air stream that disintegrates into tiny particles. Thanks to this speed, even the largest area can be covered within fifteen minutes. Treatment with mechanical foggers will take longer as the fog cannot be seen, and insecticide use will be reduced. Noise. Thermal foggers are very noisy so you’ll need to use protective headphones. Mechanical foggers are quieter and won’t bother your neighbors with any noise. Thermal foggers, cold foggers They generate insecticidal fog using either the heat of converted electricity or air flow. Cheaper to use than propane ones, are more environmentally-friendly and safe. Can be used immediately after plugging in. Require an extension cord; price; take longer to spray than propane ones. Propane Only thermal foggers They generate insecticidal fog using the heat from burning propane. Price; quick spraying; are portable and comfortable to use and transport. Fire hazardous, are expensive to use due to refilling propane, require preheating. Sometimes, propane mosquito foggers are thought to sprinkle propane but that is an incorrect assumption. They are only propane-powered units just like propane mosquito traps. For the fogger to work, a special chemical is needed. Routinely, pyrethrin or its derivatives are used. One of the popular remedies in the opinion of customers is Black flag 190255 Fogging Insecticide. Judging by the reviews, it can’t help everyone, but those it has helped say that Black Flag can eliminate mosquitoes for some hours up to 3 days. In our opinion, the result is not bad. To form your own idea about the insecticide, read other customer reviews. After spraying the chemical liquid, it is not recommended to go outside for 30 minutes, and this is especially true for children and pets. When spraying the fogger, you must wear a protective mask. Also, you may try and use natural mosquito repellents, such as Mosquito Barrier 2001 Liquid Spray. This liquid contains only natural ingredients and is safer than chemicals. It costs Check current price. By the way, users recommend spraying fogging liquid late in the evening or early in the morning, when there is less wind as then the fog will not be blown away. Whichever product you choose, remember to follow personal safety rules. Apart from gloves, wear a tested high-quality respirator, such as the M Paint Project Respirator. It is perfect for any house work connected with the insecticide use and for repairs. Over 1000 satisfied users have reviewed this respirator. Overdosing on pyrethrin is very dangerous. People with respiratory system diseases such as allergies or asthma, should refrain from using any devices with chemicals. Since natural ingredients also can cause allergies, be careful when using natural spray foggers as well. What possibilities do allergic people have, then? Use a chemical insecticide but delegate the territory treatment to someone else. Don’t go outdoors for at least 30 minutes after spraying. Use a natural mosquito fogging product; you may treat the area on your own if you wear a reliable protective mask. Where Can I Spray A Mosquito Fogger? Not everywhere. It depends on whether you use natural fluid or a pyrethrin product. YES: Any open area, such as lawns, gardens, grass-plots, summer-houses, patios, playing courts (in the absence of children), and swimming pools. The garage can also be treated provided its area is large enough. NO: Houses or any place where people live or work, mosquito foggers are only for outdoor use. Be careful when using them around ponds, rivers, and lakes and in outdoor places where there are people or animals. Unfortunately, defective units may be explosive so you must be certain that everything is all right with your device before you start it. Now that you know how foggers work, we’ll tell you about the 4 best manual foggers and will cover a stationary fogger separately. We have studied the market of all products of this category, dismissed poor products and left only those that have high customer ratings because of their efficiency. Today, there are mosquito foggers in our review, let’s begin! By the way, Burgess Fogger can manage mosquitoes even in marshy and damp regions with malicious and fat mosquitoes. One customer estimated the unit as rather profitable from the point of “fuel” economy: using Black Flag, he spends only 4-5 oz for 1 acre. But you should know that for the fogger to work effectively, it is necessary to have a tank filled with 50% (tank is 40 oz). It’s not very convenient to maintain such a volume permanently. You also need to care and clean for your fogger thoroughly each time. Many customers promptly share their experience of using a fogger and give helpful tips. For example, you needn’t worry if the tiniest drops of the product fall onto trees and bushes. The experience has shown that all these green plants can’t be damaged (but, of course, don’t spray on your vegetables and fruits purposely). While studying the products, we have found out that there are not many effective foggers. There are few time-tested foggers which have been competing with each other for many years. One such fogger is the Bonide Fox-Rx Fogger. 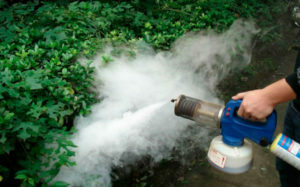 The fogger is referred to as an effective product against both mosquitoes and midges. In our review, according to the customers’ feedback, a record-breaking mosquito-free time is at least 4 days. But some families are not satisfied with the design reliability because it may become a flame thrower: the fogging fluid can ignite and shoot out flames several feet high. If you have chosen Bonide Fogger, be cautious and follow safety rules, e.g. take away dry branches and all inflammable objects. The exterior of this mosquito fogger by Burgess resembles its best selling predecessor. But this is only an illusion. In this case, we’ve got an electric fogger rather than a propane manual one. Such fogger will be suitable if you don’t want to bother handling the propane and you feel it’s easier to set an extension cord outdoors. Just like all other mosquito foggers in our review, this one is useful for getting rid of mosquitoes and other biting insects outside, as toxic steam vapors when it is in operation! The manufacturer recommends buying an insecticide that’s compatible for use with this fogger: Black Flag 190255 Fogging Insecticide for Check current price, which we’ve mentioned above as one of the best ones. How long does the effect from a single use of Burgess Outdoor Electric Fogger last? According to customer feedback, it lasts for 3-5 hours and longer, that’s why it’s sensible to use the device before an outdoor party or a barbecue get-together with the neighbors. In general, most customers are satisfied with this unit and rate it at 4 out of 5 stars. There are certain drawbacks, though. Some users complain that the fogger practically doesn’t affect the mosquito population. We don’t know if they’ve tried using other liquid substances for spraying. Also, with time, certain users have encountered problems with the fogger’s thermostat and with finding a spare one to replace it. It is possible to find one, though. When you’re about to finish treating your place, you can turn it off as the hot fogger will keep on working for about 5 more minutes without being plugged in. This is especially convenient for farther spots where the extension cord doesn’t reach. To improve the fogger’s operation, keep the chemical substance tank at least half full for better pumping. To extend the fogger’s life, clean the pumping trigger after use. This may not be pleasant, but it is certainly necessary. It is the only cold fogger powered by electricity in our TOP. This fogger hasn’t yet become very popular among the people looking for outdoor mosquito foggers to solve their pest problems. But it is not the fault of the product. Indeed, it is unknown among customers, or they don’t know all its useful attributes. The reviews of happy customers allow us to make a conclusion about the quality of the fogger. Judge for yourself: it helps to eliminate mosquitoes outdoors and basement mold if necessary. Those who risked using the Tri Jet Fogger against insects indoors say that after spraying, there will be no spiders, roaches or any other bugs left (though we advise applying indoor mosquito zappers). This fogger is easy-to-use: you only need to fill the reservoir with the product, choose the required fog density, and switch it on, and you are done! Experience shows that for outdoor use, you need no more than 1 quart of insecticide for 1000 sq ft in the medium mode (the reservoir of the fogger is calculated for 1 gallon of fluid). This is really a rare case in our reviews, but, according to customers, this fogger has only one defect – it is an expensive mosquito killer for some people. This price is low, considering that this non-thermal fogger is stationary. This is yet another cold fogger in our review. Unlike Tri Jet, this device’s engine is powered by petrol. It hasn’t also become the most popular gadget due to its high price tag (Check current price). This price is justified, though, as the sprayer is well thought through. It resembles a backpack and its light plastic design contributes to its mobility. Insecticide and fuel tanks are built-in, so the device is rather compact. The device uses electronic ignition, similar to a chainsaw or a motorbike. The manufacturers also tried their best to maximize the safety of this device as all of the foggers’ heated elements are well-protected so that you cannot get a burn. It is used not only against mosquitoes, but also to cure crops and remove other pests in gardens in fields, both in rural and urban areas. By the way, Beamnova can be used not only with liquid but also with (dry) dusts. So far, there haven’t been many reviews, but the majority of them are positive. Customers report that the fogger turns on very fast, works trouble-free and is able to cover up to 30 feet in windless weather. However, some users complain that the use and assembly manuals supplied are not that useful, but the Internet can easily solve this issue. Mosquito larvae. The Department of Entomology University of Wisconsin experts once again warn that amateur fogger use can have negative consequences. When you eliminate flying mosquitoes, remember that getting rid of the flying pests must begin with larvae removal. The more dead larvae there are, the less there will be adult insects. Foggers will kill flying adult mosquitoes, they are great for large territories, bushes, trees and lawns. For such places as the house foundation or other moist areas where larvae settle, you’d better use a special sprayer like Beamnova rather than a fogger. Aerosol foggers. If you don’t want to deal with large foggers and sprayers, go for an aerosol fogger, which is cut-rate, effective and will quickly kill all insects on contact. Pick only tested brands, such as Cutter. You will find in their product line both a synthetic chemical spray and a lemongrass-based natural one that can be safely used around children and pets. Mosquitoes are a pain in the neck, but we hope that our information about propane and electric foggers will help you live easily through the coming mosquito season!